Esther Stüdli will present the workshop “Denn Sie wissen was Sie tun.” at the HEALTHINAR event on 18 September 2015. Read Esther Stüdli’s portrait in German. 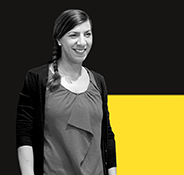 With over ten years of experience, Esther Stüdli has a vast knowledge of design. She studied at ZHdK (Zurich University of the Arts) and has been working for numerous agencies and companies since 2002. She was founder and manager at gut&schön agency and with her own agency Stern-Design she now consults clients from various industries, develops creative design concepts and realizes projects of visual communications – always following the principal of professional integration of content and form. Her work has been awarded with the reddot design award. The focus of her workshop session is on visual communication and intervention in healthcare. The goal of this workshop is to sharpen the perception and to create awareness for professional use of visual communication elements which stimulate all the senses. During the two-hour session, we will develop extensive theoretical knowledge and also test the possibilities of practical application of various concepts and techniques. As a special highlight, the workshop features a guest speaker from the design research department at Bern University of the Arts (HKB) who will give us some input on HCCD – Health Care Communication Design. -> Get your ticket now, and learn all about visual communications in Esther Stüdli’s workshop.